Just a brief posting this week to draw your attention to a new feature on this website, courtesy of my lovely web support at Wick It Services. With well over eighty articles on the site it seemed a good time to introduce an Index, which you can see at the bottom of the left hand menu. That means there are two ways to search for topics of interest, using either the ‘Search’ box above the main menu which will search for anything you enter there, and the Index which lists all the tags that have been attached to articles. So for example you can see there are four references to Rose Hall, five to smallpox but only one to lunacy! 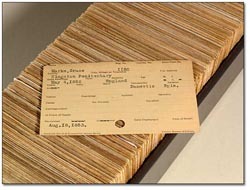 Thank goodness I don’t have to type up and organise a card index system like the one pictured. Quite co-incidentally it refers to Kingston, but in this case it is in Canada rather than Jamaica. If you are interested in transcription of Wills or other documents it is always worth checking out the ‘Latest Additions’ page. Today I am off to a conference at the University of Derby on Enlightenment, Science and Culture in the East Midlands c.1700-1900. While I expect the emphasis to be largely local it will be interesting to see whether there are references to the West Indies and Jamaica. If there are I will report back. This is an excellent idea, Anne. I often find an interesting website or blog which I can’t search and feel fed up because reading every post/page would take far too long. I do hope it will be useful. At least it will help me find things I’ve written after I have forgotten when that was!